i’ve long considered the Island Hopper an #avgeek (someone who geeks out about aviation) and travel enthusiast rite of passage. 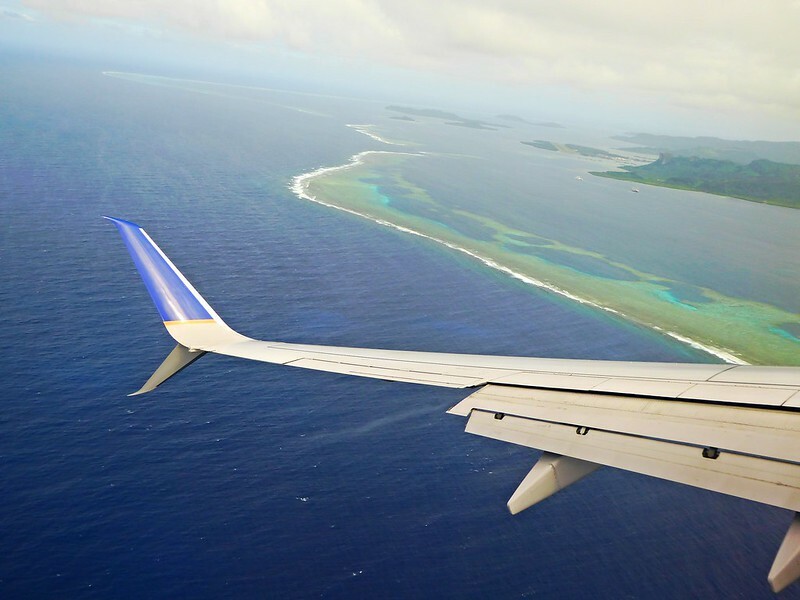 these routes used to belong to Air Micronesia, a part of Continental, which got folded into United’s operations when they merged a while back. 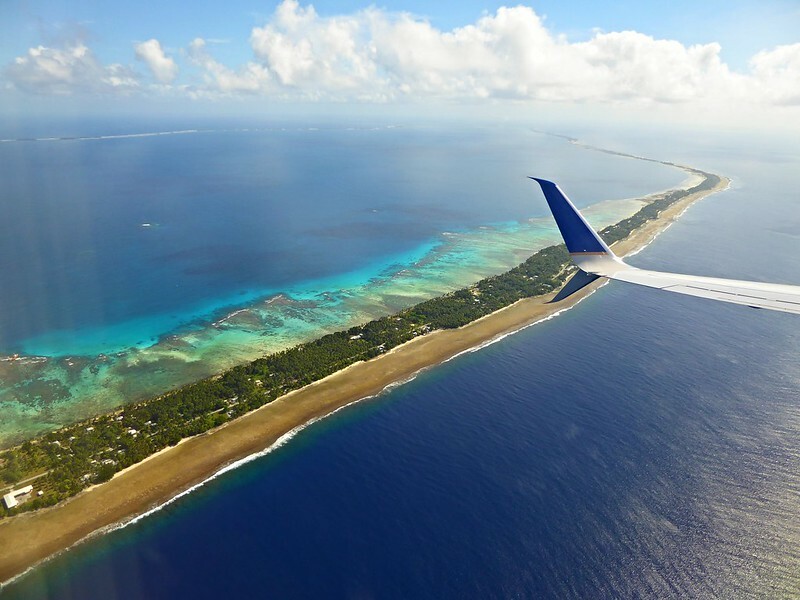 in a nutshell, the Island Hopper route, which is only fully flown a couple times a week at most, starts in Honolulu or Guam and makes brief stops on islands that have a historical connection to the United States. 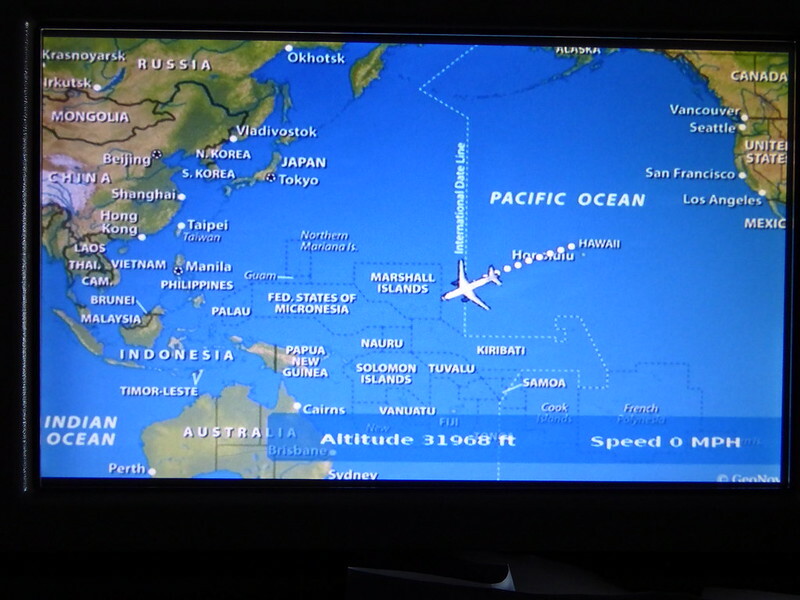 i think i was able to piece together an itinerary with as many stops as possible to cross the Pacific, or close to it. it required an overnight in Honolulu (oh boo hoo) and then travel the full next day (about 24 hours total for me to get from Honolulu to Manila, i think?). 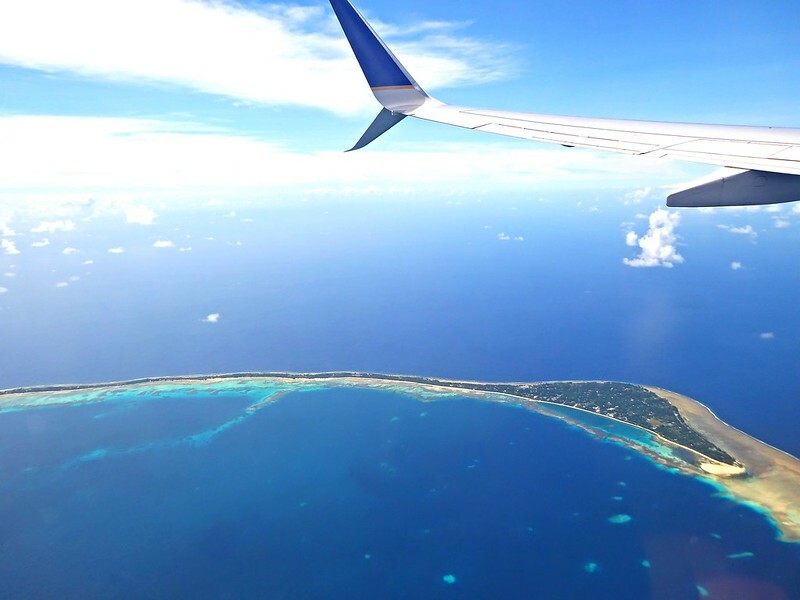 the Island Hopper is a single flight number that most people apply to the Honolulu-Guam flight with five intermediate stops, but i found a flight to Manila that stops in Koror, Palau for extra hopping pleasure. and yes, the HNL-MAJ-KWA-KSA-PNI-TKK-GUM-ROR-MNL flights are all on 737s. 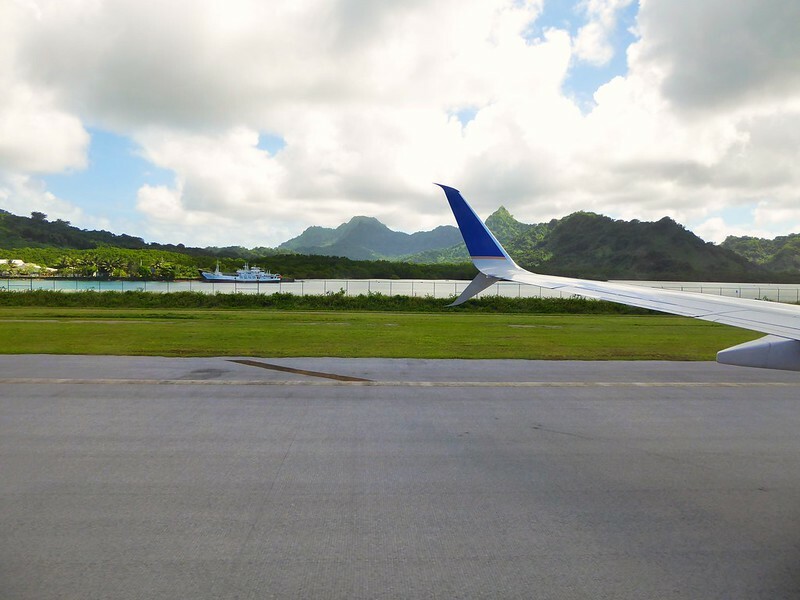 i won’t cover the Guam to Palau to Manila flights here because it was pretty normal, and it was at night so you really couldn’t take pictures anyways. 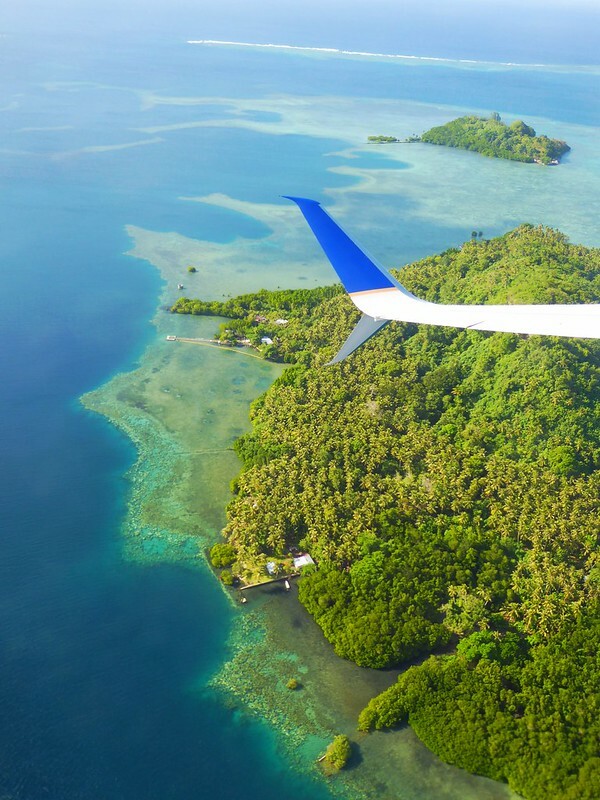 i booked this as a round trip from San Francisco to Manila — if you book it on days the Island Hopper runs, it will give you that flight as an option on the United website, for a minimal extra cost, if any. 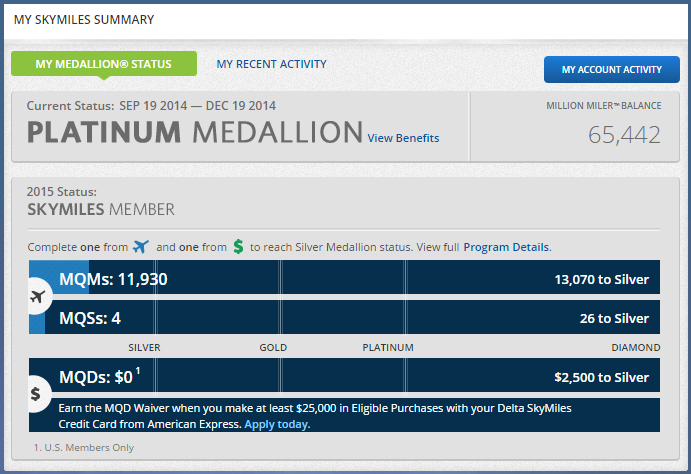 fwiw i paid $760 roundtrip. but why would i do this? (you’ll get that question a lot…) because. just because. and because the views were supposed to be beautiful — and they were. 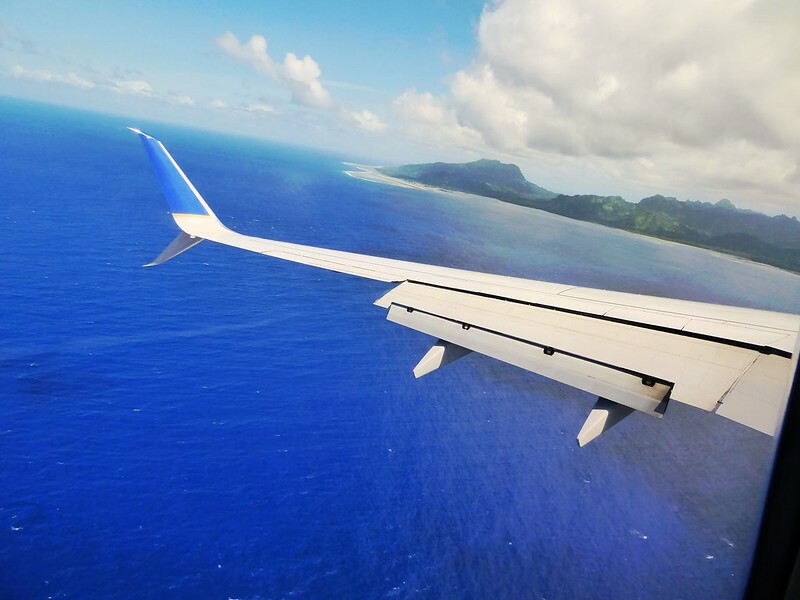 honestly, if you can’t get a window seat, don’t even bother. 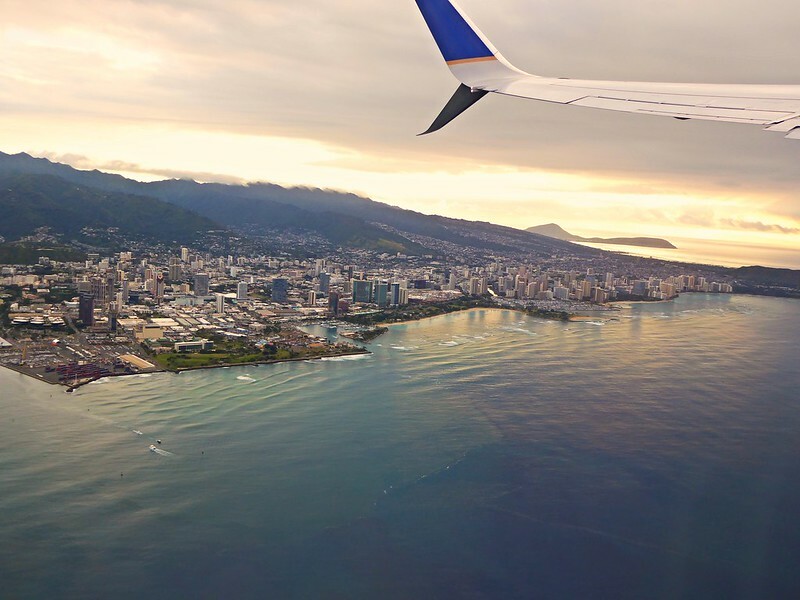 Just leaving Honolulu — flying by Waikiki on our first hop. i really enjoyed our Guam-based crew. 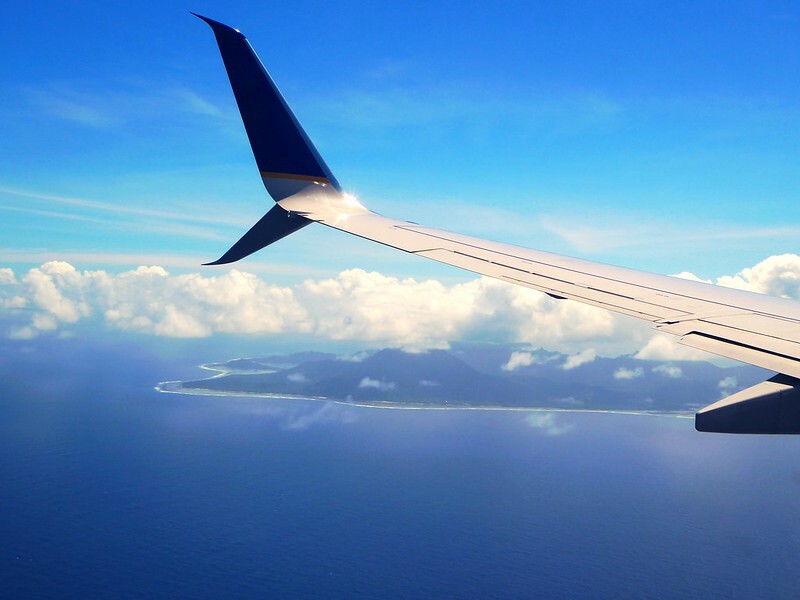 even after all these years of flying this route, they can’t believe anyone actually flies it all the way through when there’s a direct flight available. maybe they’re jaded about the beauty of it all? 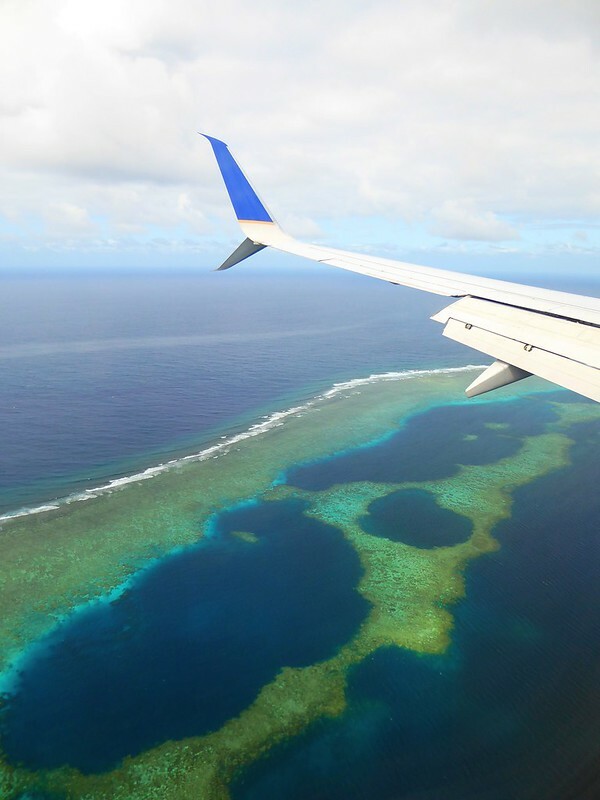 i was surprised the crew continued all the way through the entire 14.5 hour length of the Honolulu-Guam flight. 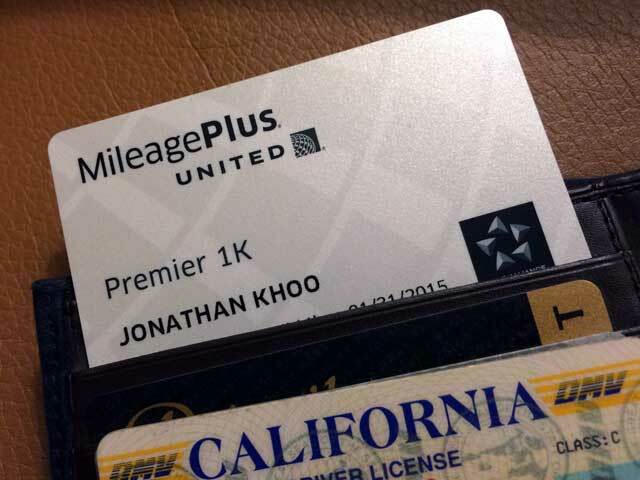 Ron, our Inflight Service Manager, gave me a personal greeting as a 1K elite, even in economy. WHEN DOES THAT HAPPEN?! 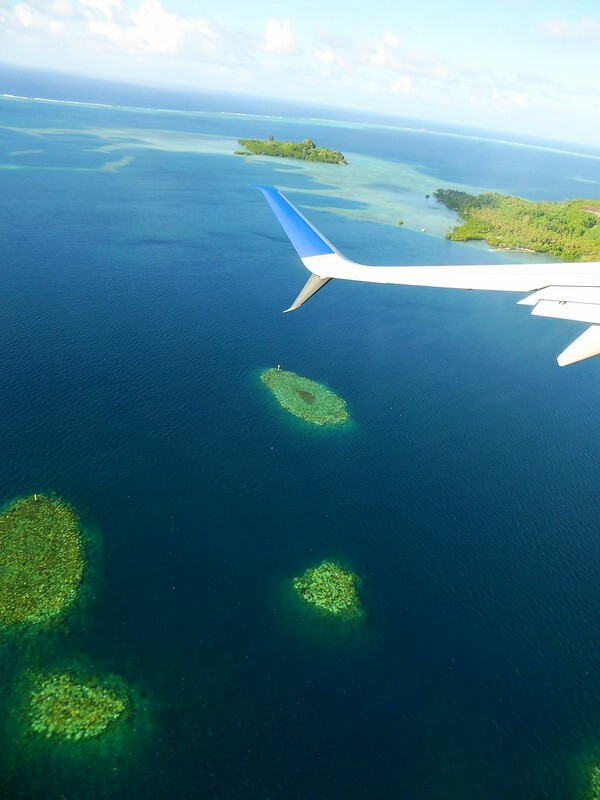 reports said the left side of the plane is the best side for views heading west; they were correct. on some landings the island was to the right, but we always swung around so we had a view of it at some point. i had upgrade requests put in for my entire journey — everything cleared except the HNL-GUM hopper, because all segments need to have the same seat available, i suspect? it was post-holidays so i think a lot of military people were coming back from the mainland. 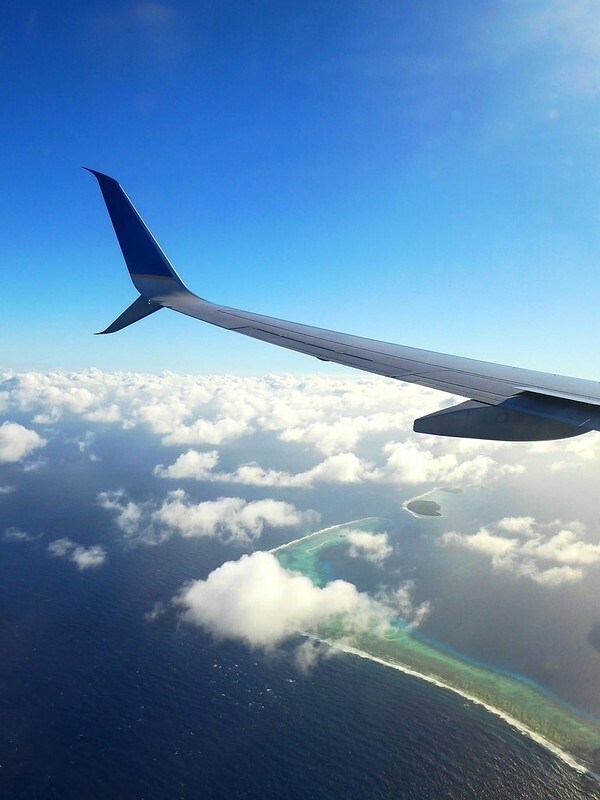 the flights were, for the most part, full. i originally had a seat in Economy Plus, but a few days before the flight i noticed the configuration changed. i was in 11A, now a row without a window, said SeatGuru. there were only regular economy seats left (in new rows that magically appeared in the back of the plane). i’m not sure if it was just by chance or if there was some sort of blocking involved, but the middle seat was empty for the entire time (most people do not fly the entire length). don’t be the guy who was in the aisle seat next to me the entire length. 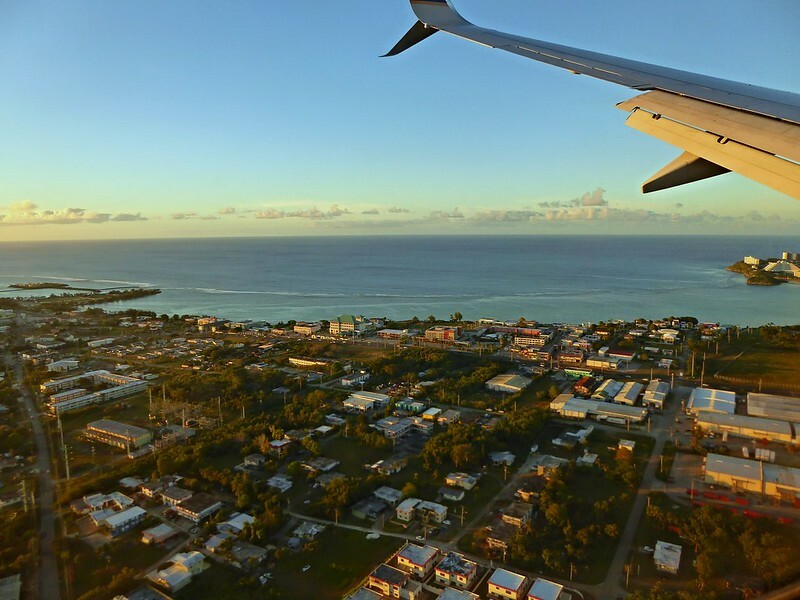 he was coming home to Guam from Washington state, but he missed his flight and got rebooked on the Island Hopper without knowing it. he could have been on a direct flight that takes half the amount of time. and the poor guy had a horrible toothache that started after he left Washington so he was miserable. really nice otherwise, but man, poor thing. it’s definitely fine in regular economy, as long as the seat next to you is empty. i’m not sure how well i would have fared if i didn’t have that extra room. there was a five minute delay at KWA because someone noticed a dead bird on the runway during landing and it had to be cleared. in the past it seemed that they forced alternate sides of the plane to disembark at each stop so they could do a security sweep. 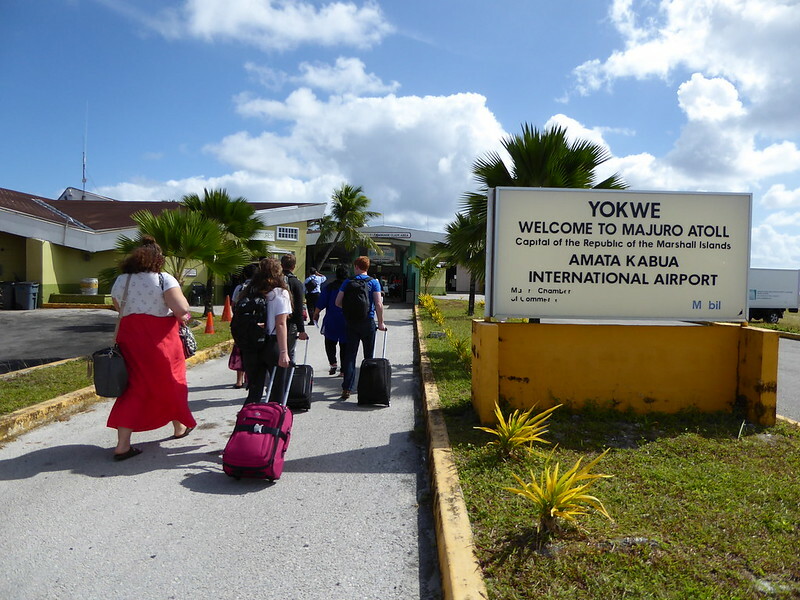 now, disembarking at each stop (which lasts anywhere from 25-40 minutes or so) is optional (except at KWA because it’s an army garrison, so no getting off the plane at all). if you DO get off, you need to take everything with you. any bags left on the plane have to be identified by someone on the plane as belonging to them during a security sweep, or else it gets taken off. when you get off the plane, you go directly into the departures area of the airport (sometimes not much more than a glorified shack). they reboard the plane by group number; ideally you’ll have a low number because overhead space can get tight. 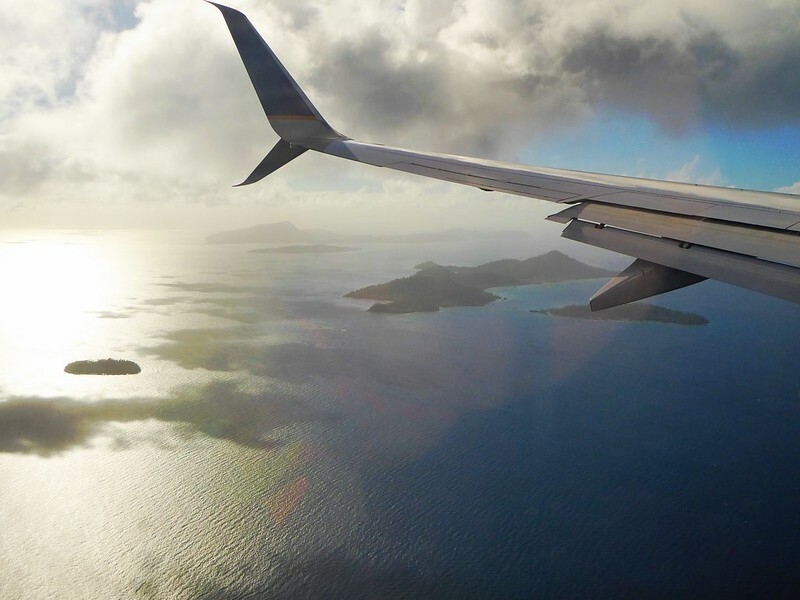 it can get blustery on these islands during landing, so hold on tight! t-mobile free international roaming doesn’t work at any of them. 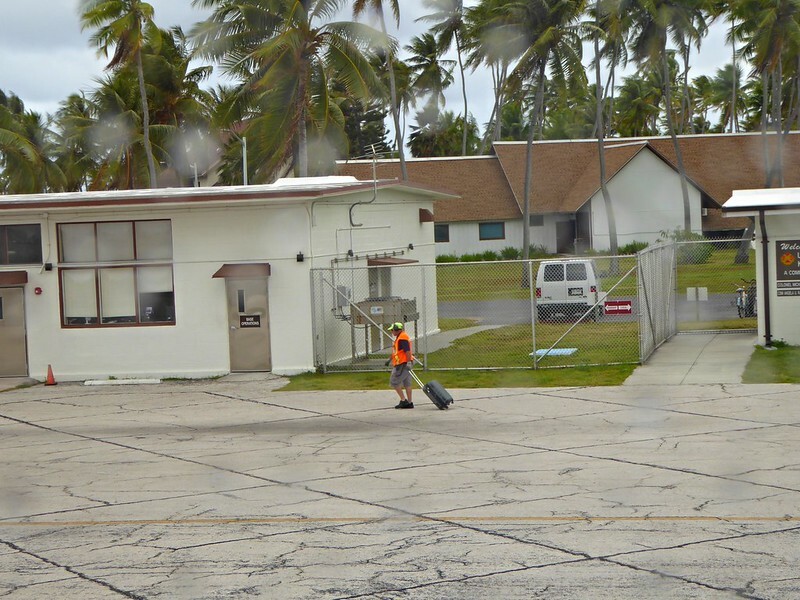 Kwajalein: public access point which worked, but poor reception. i suspect how well it works will depend on where the plane is parked and your location on the plane. Kosrae & Chuuk: wifi portal asks for you to enter a scratch card code, but i wasn’t sure where to buy these. i assume from the kiosk in the terminal. the planes are 737s with the new signature slimine interior. there is seatback entertainment in all rows and power plugs in Economy Plus (and first class). there are less than a dozen looping movies for the entire flight. you know, though, time passed a lot quicker than i expected; most of the hops were about an hour long. someone’s unclaimed carry-on being taken off the plane. don’t be this person! this was one of the segments where the right side might be better, but don’t quote me on that. they save the best for last. alas, because of the way the sun was now hitting my window, there was a lot of reflection so the pictures didn’t come out that well. 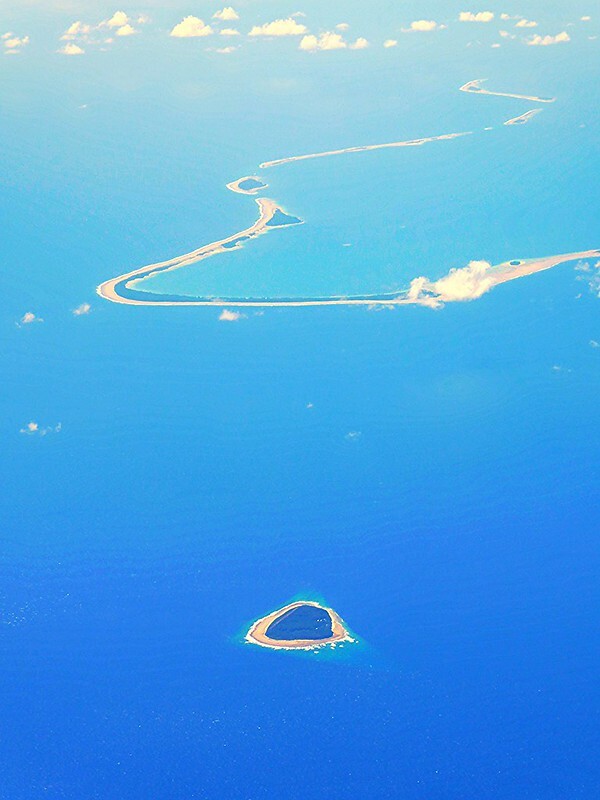 there’s a wonderful V-shaped island though — keep your eyes peeled for it! as i’m sure you would hear from anyone who has done The Hopper, you have to see it to really experience the beauty. pictures truly can’t do it justice! p.s. 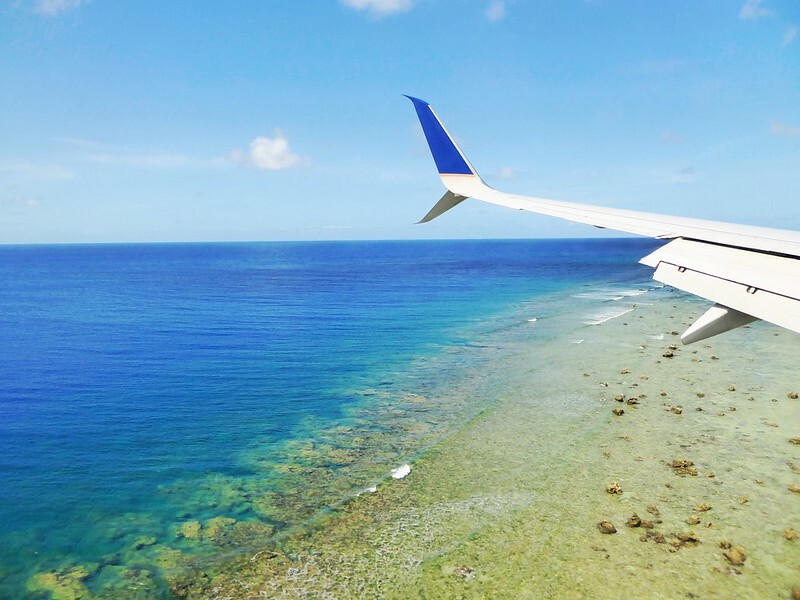 thanks to United’s Guam hub, there may be some cool options for you to come back! 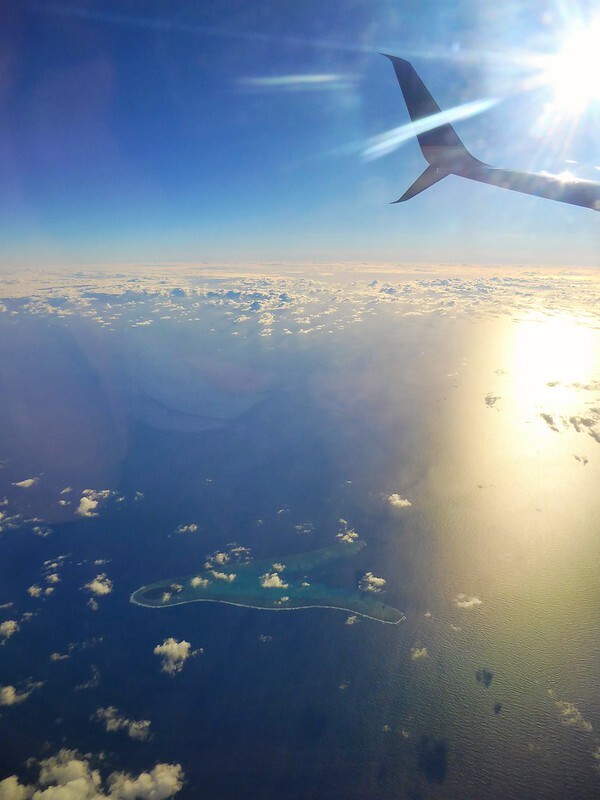 i was originally scheduled to do MNL-GUM-HNL (overnight)-SFO, but managed to do a same day change when i arrived at Guam to go Guam-Tokyo-San Francisco (direct), with a day in Tokyo! and the great lounge agent was able to keep my upgrade. two thumbs way way up. Poll: Regular aisle seat or extra legroom middle seat? I Just Made United 1K. Now What? 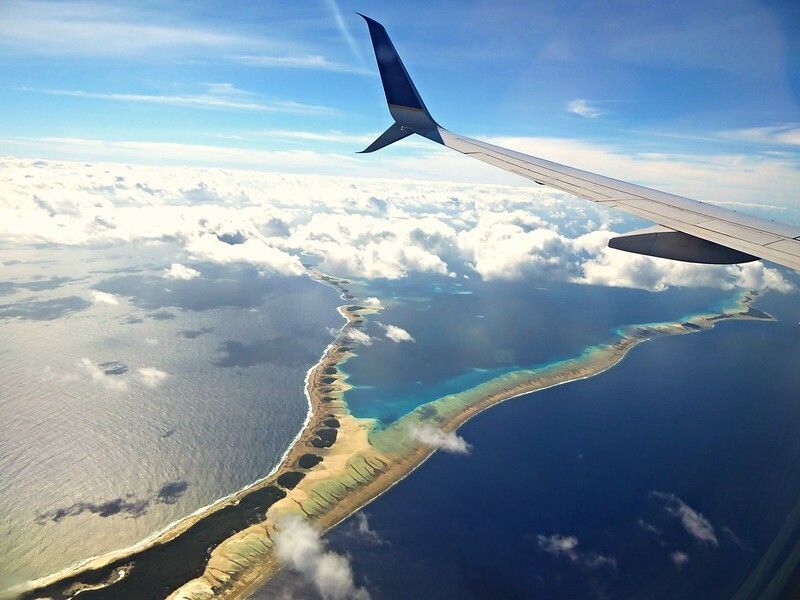 15 Comments on "Crossing the Pacific in a 737: the United Airlines Island Hopper"
Amazing pictures. That seems like an incredible experience. 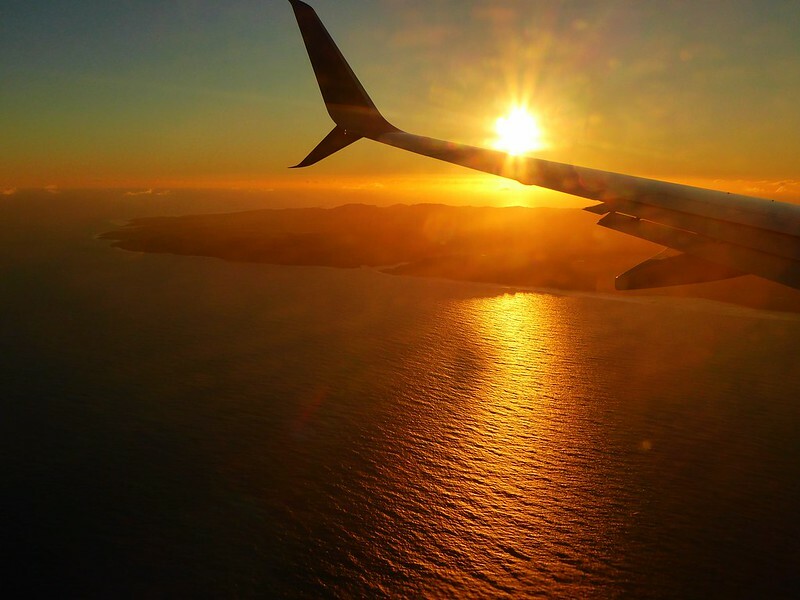 I am glad you were able to switch to the window seat. 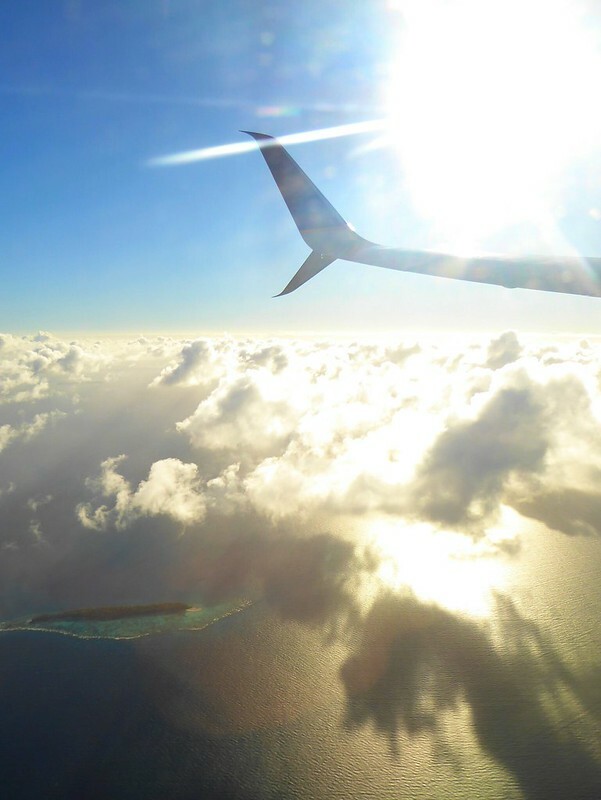 Doing this flight in a non window seat makes no sense as those views are amazing. Do you use an iPhone camera or were these with an SLR? 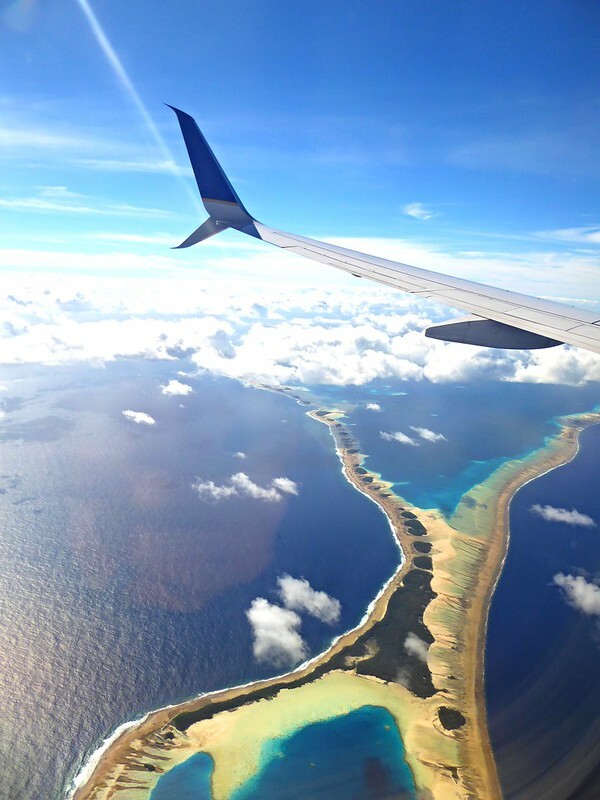 I usually do a post, every 6 months or so, featuring some of the best photos from a plane window. If you don’t mind I’ll use a photo or two (of course crediting them to you and linking to this post). Just gorgeous. Wow. I just realized we were on the same flight. I was one of the FOs. 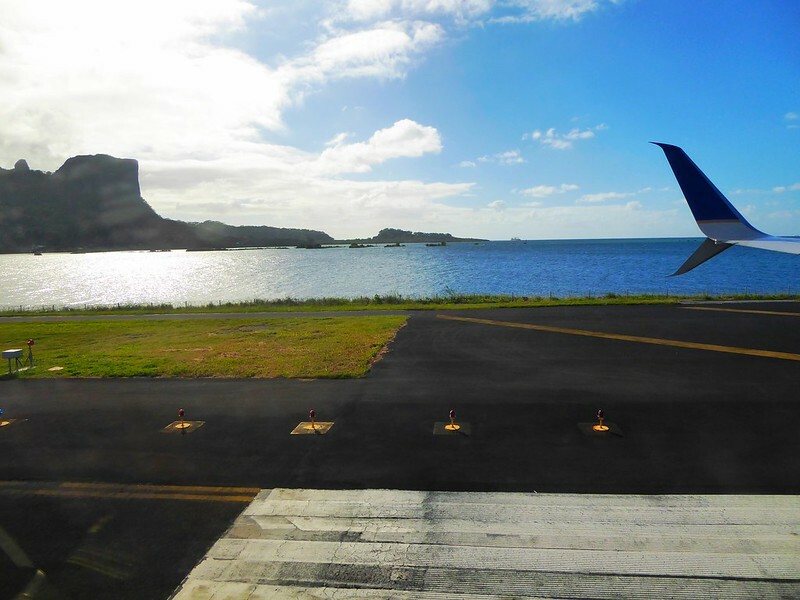 I worked the HNL-MAJ leg and rested the rest of the way. Glad you enjoyed the trip. oh cool deal!!! thanks for a great flight! 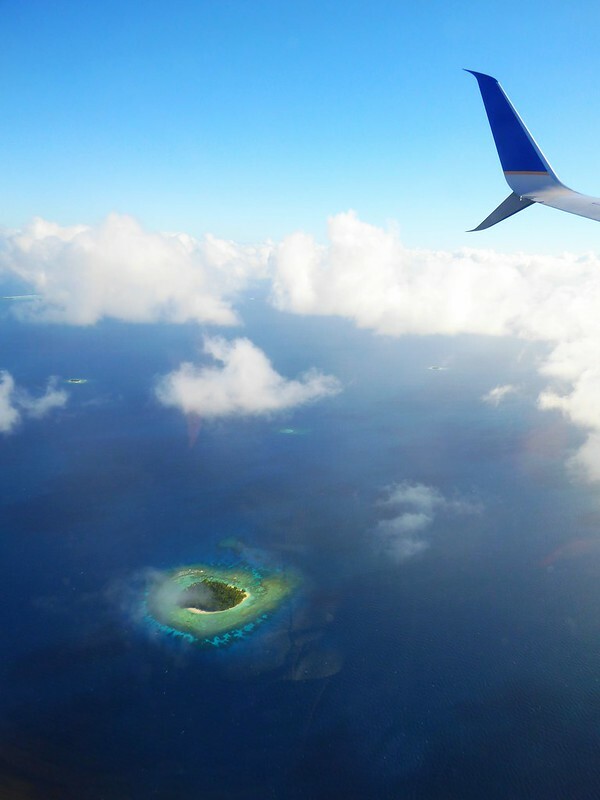 When you traveled between the tiny islands did they ever charge you a departure fee/visa or anything of that sort, I am 16 and a huge AvGeek and my dad works for a UA affiliate, I am considering coming all the way from Atlanta for this flight. hey! nope, no fee or visa required at all. you don’t really ever leave the airport anyways. i hope you get to do this sooner or later! it’s a really cool experience! 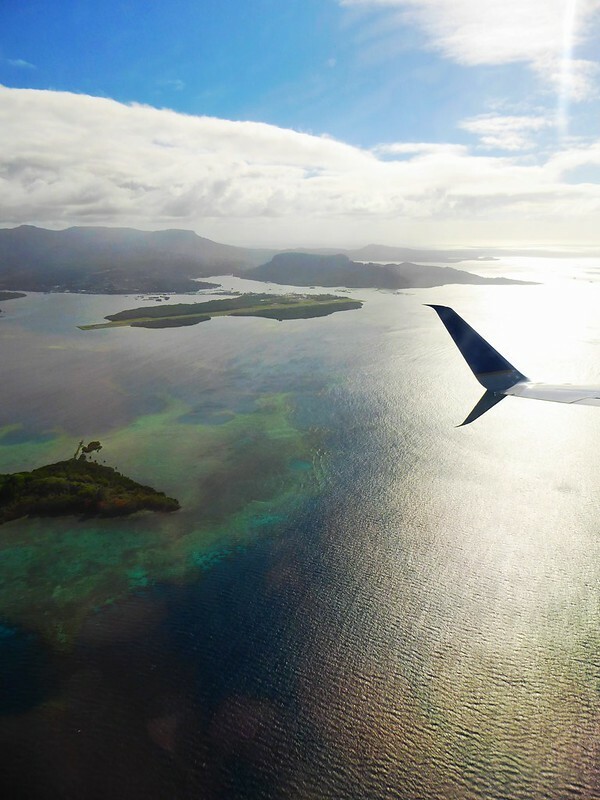 were you able to explore the islands like an overnight lay over? or those are all just regular few hour lay over at the airport? thanks. Hey, trying to book this online but it’s not working. 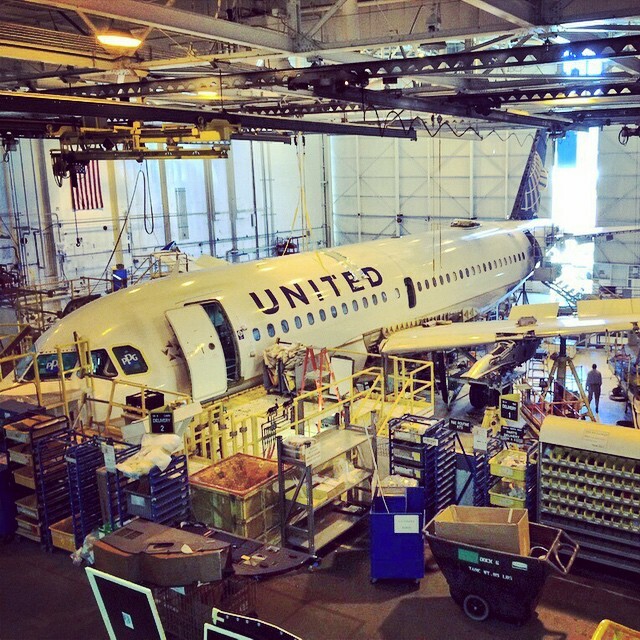 Can you give detailed instruction on how to do the SFO-MNL? Thanks. 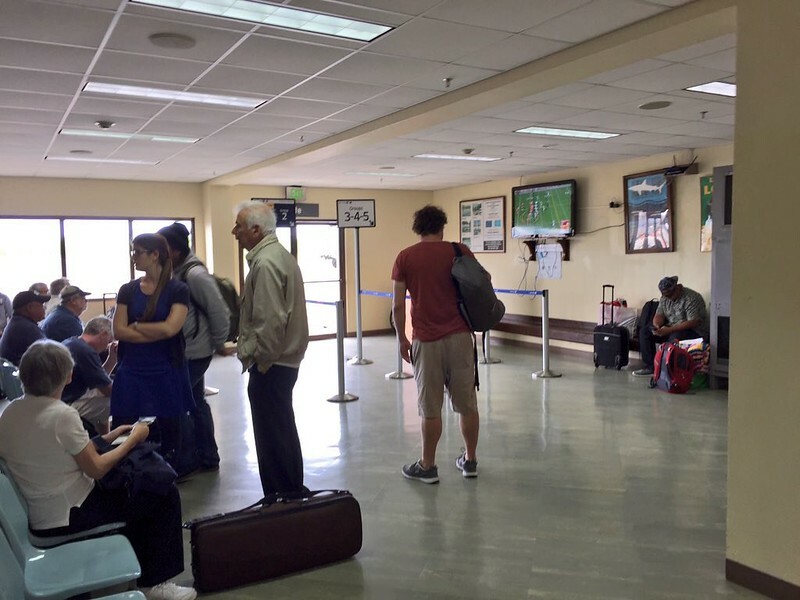 hi ed–you may need to break it down into multiple segments, and keep in mind that the island hopper doesn’t run on all days, and to make sure you book the flight that has the extra hop GUM-MNL that makes a stop at ROR. for this sample booking (that’s a link even though it doesn’t look like it LOL) i did a multi-city booking SFO-HNL on a Sunday, HNL-GUM on the Monday after that (meant to do June instead of July, but same thing), and then GUM-MNL on the Tuesday. 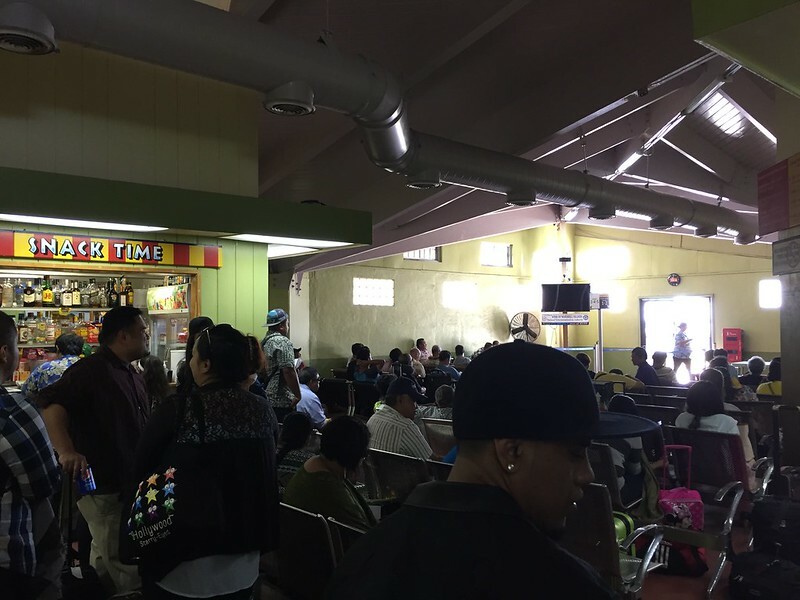 The IHOP leaves HNL Monday, Wednesday and Friday, arriving in GUM the next evening. The GUM-ROR-MNL only runs Tuesday and Friday. 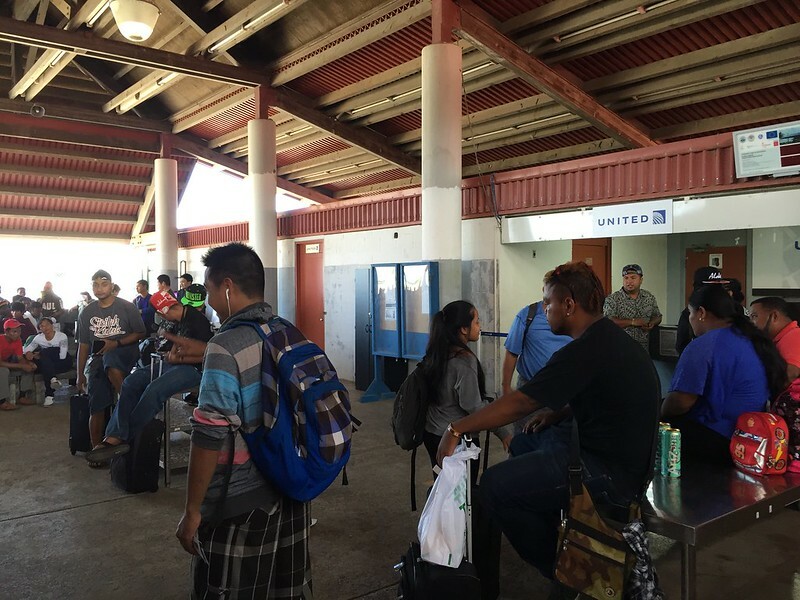 Therefore the only day you can make the connection all the way is to leave HNL Monday. 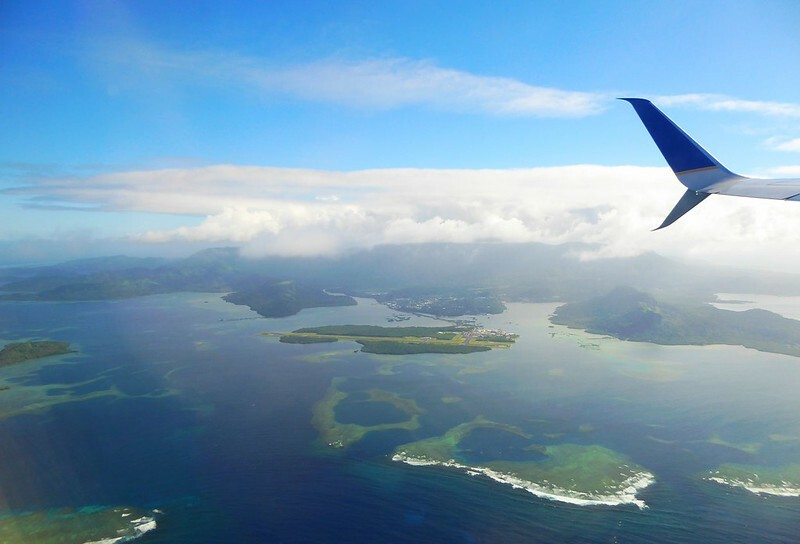 Got this one booked next March with HNL-GUM as a free frequent flyer ticket and GUM-MNL as a paid ticket. Hopefully HNL will let me check my suitcase all the way through to MNL even though they’re separate tickets. ahh nice! i hope so too! have a great trip!